The Harriers announced the signing of two more new players today when Andy White returned to Aggborough for the third time, this time for a complete season, and Stuart Whitehead arrived from Shrewsbury Town to bolster up the defence for the next two years. We're all familiar with Andy around these parts from his two previous loan spells at the end of 2003 and again at the start of this year. In between those times he's been to the Championship side Crewe, fellow Conferencers Burton Albion and finally to Notts County where he failed to hit it off with their fans and met derision every time he came on to the pitch. We know he's not the fastest out of the traps but he puts in a lot of work holding the ball up to bring others into the game and that's something we've been missing for a long time now. 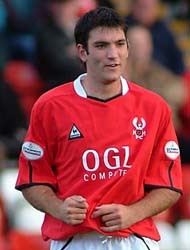 Stuart Whitehead was born locally in Bromsgrove but he seems no worse for that terrible experience and, after playing a few games for his village team, started his footballing career in earnest at Bolton Wanderers but failed to play in many games before departing for Carlisle in the Summer of 1998. It was there that he found his niche in life and went on to make almost 170 appearances for them and played against us on more than one occasion. 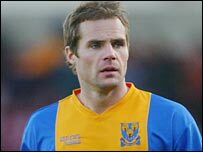 He then went to Darlington for a season and then took a big drop in footballing terms to, the then, Telford Utd before eventually signing for Shrewsbury Town where he again enjoyed a decent spell in front of a crowd that appreciated him. He's signed for us for two years and now brings our squad level up to twelve players with at least six more due through the doors soon and it's not even June yet!